AUSTIN, Texas (April 22, 2002) Whole Foods Market (NASDAQ: WFMI), the world’s largest natural and organic foods supermarket, announces its plans for a new 80,000 square foot landmark store and 200,000 square foot office tower in downtown Austin. Whole Foods Market has signed a long-term lease with Schlosser Development Corporation to develop the block of property located on Lamar Blvd. between Fifth and Sixth Streets. The ground breaking is scheduled to take place late this year with an estimated completion date in early 2005. The new location will be the largest Whole Foods Market store currently in development and it will be more than double the size of its current downtown Austin location across the street from the new site. This innovative new store concept will continue to fulfill the company’s mission of supporting sustainable agriculture and the environment by featuring natural and organic foods, which are free of artificial preservatives, colors, flavors and sweeteners. With a focus on the highest quality and best-tasting fresh foods such as produce, prepared foods, bakery, meat and seafood, the store will appeal to a variety of customers ranging from health conscious households to serious gourmet cooks. A key aspect of the property is the capability to include an office tower for Whole Foods Market’s new worldwide corporate headquarters to accommodate the company’s steady growth. 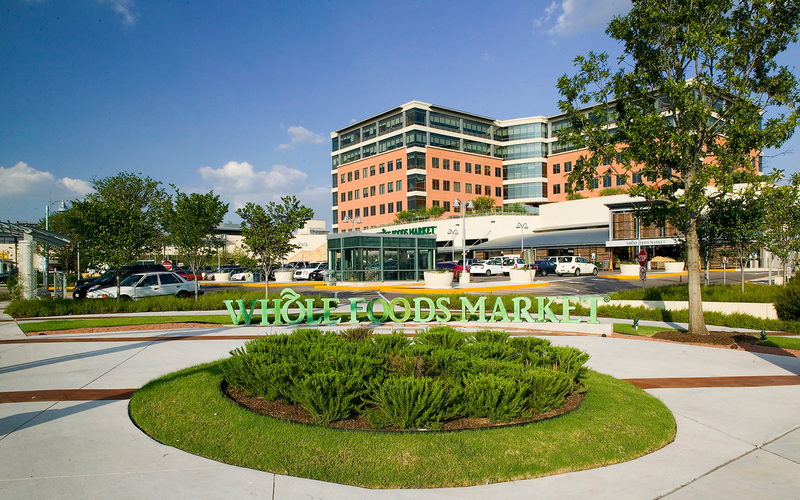 Whole Foods Market is one of Austin’s largest employers with 800 team members at its two retail stores, corporate headquarters, regional office, distribution center, and bake house. Celebrating its tenth year being publicly traded on the Nasdaq Stock Market, the company has produced impressive financial results and seen strong stock price performance. Last June, the company split its stock 2-for-1 and recently traded at a new all-time high of $47.50 on March 20, 2002. “There are so many exciting things happening in downtown Austin right now and Whole Food Market, being such a successful, homegrown Austin company, is uniquely positioned to best capitalize on all the wonderful opportunities an urban location such as this offers,” said Brad Schlosser, owner of Schlosser Development Corporation. Schlosser will be developing an additional 5,000 square feet of speculative retail space on the site, as well as 30,000 square feet of speculative office space within the 200,000 square foot office tower. HKS-Dallas has been selected as the architect for the project.